Today I went in to school with every intention of getting my room done and I ended up cleaning out a filing cabinet....really not an effective use of my time, as there is zero likelihood any parent will ever look inside there. "Oh hello Teacher, your room is a chaotic mess but let me go look in that file cabinet in the corner because I am sure it is super organized" Yikes...I need to light a fire under my tail!! I'm going back tomorrow and I will get it looking good. Let me just repeat that to myself about 100 more times. Maybe I could get a recorded message and play it while I sleep. On a more useful note, I have a wonderful list of links to share with you. 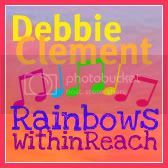 Debbie Clemments from Rainbows Within Reach posted an awesome linky with her post yesterday which will take you to over 25 great freebies!! Thanks so much for joining the fun and sending the ripples out further -- by sharing!